« Back in the Playoffs! This was one of my favorite movies growing up because it laid out a situation that a kid could only dream of. Sure playing in the Major Leagues at 12 is cool, but how about running your own team? 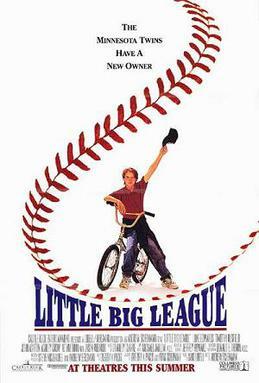 Little Big League is a classic baseball movie that includes many things you don’t normally see. The biggest example of this is the way the movie ends, they lose. Unheard of in sports movies! But that doesn’t mean its bad, in fact I love it. In fact, this movie has always left a soft spot in my heart for the Minnesota Twins. This might tie in to the fact I like Minnesota in general, outside of their airport. Why do I like Minnesota? Because its basically Canada, and I love Canada. The Twins have a bunch of Canadian players too, so it all makes sense. If you haven’t seen Little Big League, then you’ve missed out. Go out and rent this classic. It’s not getting any awards, but it will bring a smile to your face. This entry was posted on April 3, 2011 at 9:53 pm and is filed under Movies Countdown. You can follow any responses to this entry through the RSS 2.0 feed. You can leave a response, or trackback from your own site.